Have a little “sole” and enjoy your active lifestyle in comfort with our 100% woven athletic socks. 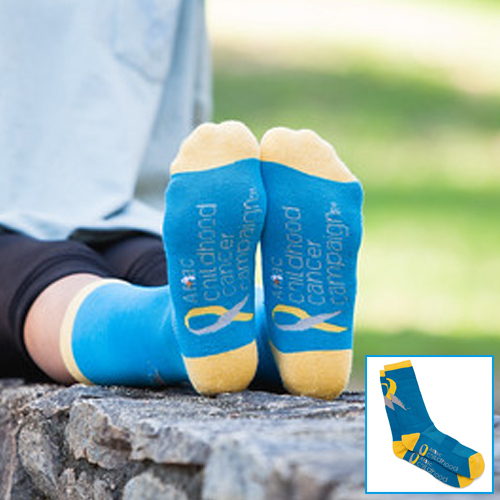 Made of the highest quality cotton, the socks feature custom artwork with the Pediatric Ribbon and Aflac Childhood Cancer Campaign logo on the soles of the socks. 77% cotton, 21% nylon and 2% Lycra® Spandex. Fits men's sizes 6-13 and women's 7.5 and up. Net proceeds from the purchase of this item go to the Aflac Foundation, Inc.